Worcestershire County Council seems a little confused over what constitutes value for money in recent months. The council have reportedly recruited an extra 1200 staff since 2000 and now have more council workers than when they were a joint county with Hereford. What is more they are now looking into recruiting a new Chief Executive with a bumper £170,000-a-year salary to the authority, despite being criticised by council members of all parties. Regardless of this they are content to make significant cuts to services, stating the need to make £25.8m of cutbacks over the next three years. Unfortunately it doesn’t seem like these savings are being made through cuts in bureaucracy and instead those most in need are suffering as Worcester News reports today that local pensioners will be losing their meal service in order to recoup the £50,000 they cost every year. That’s less than a third of the new Chief’s salary . These elderly people, many of whom are registered blind or disabled, will have to make do with frozen meals rather than the hot home-cooked dinners they are used to, a necessary sacrifice according to the council. A West Midlands TaxPayers’ Alliance activist has been investigating the legitimacy of what the council have been calling ‘efficiency savings’ and recommending that the council reduce unit costs in order to save money, rather than compromising front line services. Very few staffing cuts were noted in their budget plans to save £8.22 million this year, and instead there are obvious cuts to ‘Older Peoples Services’ and the closure of Outdoor Activity Centres – neither of which could genuinely be described as efficiency savings. It seems Worcestershire County Council are loathe to reduce their number and instead are happy to make cuts in service delivery under the guise of making money-saving changes. It is particularly unfortunate that the elderly and vulnerable are paying the heavy price of supporting this large wasteful council. 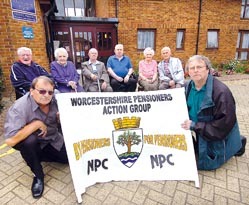 Let Worcestershire County Council know exactly how you feel about this unfair treatment.